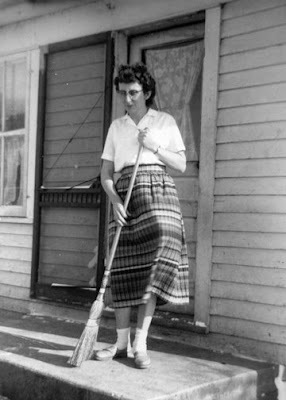 This is my grandma, Minnie May. She loved fashion and sewing. She was crafty. And in my eyes, good at everything. She made delicious meals. She was silly and soft spoken and would say phrases like 'oh my stars.' She was the best and sweetest grandma ever. And she taught me lots of things. Sewing, crochet, stitching of all sorts, baking... a lot of the special things a granddaughter gets to do with her grandma if she's lucky. But one thing I never got the chance to learn from her was one of the crafty skills she was best at: quilting. I remember admiring her works in progress stretched out on wooden quilting frames in the basement. And the quilts she had spread out on every bed. I loved snuggling under them when I stayed overnight at her house. And before she passed away, she had tucked away a special quilt she had made for each of us grandkids in her closet. So this year, I promised myself that I'd learn to quilt. And I'm so happy I did. It's cheesy but I do feel as if I've bridged a gap and done something that maybe my grandma had always wondered or hoped I might learn to do. I wonder. It's no surprise since I had her example to look up to. 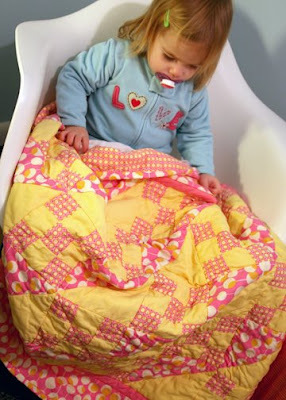 And I have to admit that it felt really special to give my first quilt to my little girly. My grandma inspired me to do this and now I feel like no matter how imperfect my quilting attempts may be, it's still something us girls can share. Something I can love that I know my grandma loved. And maybe a skill that I can teach to a certain someone someday who may or may not want to learn. We'll see. And now for something a little less likely to make me weepy... I finally finished knitting my first hat! It's the robin egg blue hat pattern from Ravelry that I had started and re-started several times with different yarns before finding this awesome color and falling in love. I like my hats a tiny bit big, and I'm so glad this fits so well. And covers my ears. What a beautiful post... and a lovely story. My grandma passed when my father was only 17 years old. So therefore I never new her. She was a sewer. I just recently became a quilter myself about a year ago. I never in a million years thought that i would ever sew anything. But I do only by machine. I have no clue how to hand sew. I want to learn how to knit though. That is a goal of mine this year. Keep up the great work!! 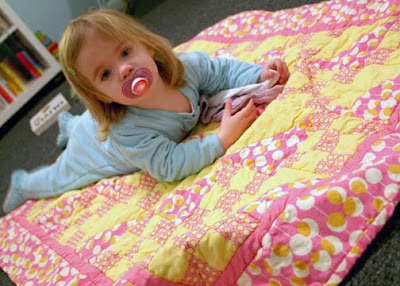 I love the quilt you made for your daughter. The colors are gorgous. loved this post. your grandma sounds amazing. i had a great crafty, knitting grandma too. so cheers to awesome grandmas! and that hat...um yeah i want it. i might have to learn to knit just so i can make one just like it. OK, I'm all weepy here too. This is so sweet. Count me in among the ones with awesome Grandmas. Both of mine were domestic divas themselves. Quilting is still on my to-do list for someday but your post is definitely another nudge to get on it. 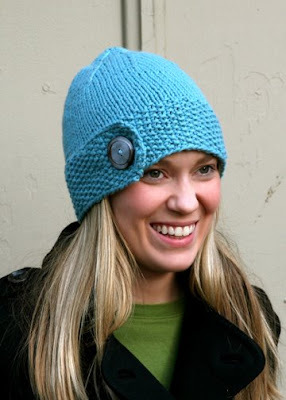 The robin egg blue hat is also smashing. Love the button, too! LOVE L's quilt! So pretty. Wish I had little girls. I don't think my boys want a pretty little pink quilt. I'm another one with crafty grandmas who made me quilts. I think of them all of the time when I look at them. I want to do a quilt too. I know HOW to quilt. I just have to actually DO it. And I love that hat. I need a hat to cover my ears too. They seem to be difficult to find so I may just have to make one. My favorite hat got shrunk this year and was beanie size after it came out of the wash. Not good. 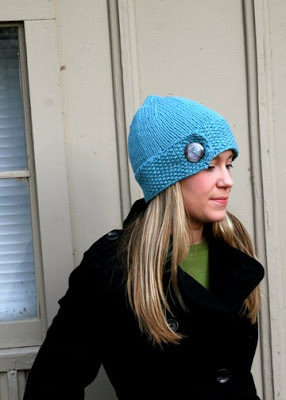 Love the hat, I really want to learn to knit too! what a sweet post about your Grandma, beautiful! And I freakin' love that hat you made!!!!! That's awesome!!! I want to learn to knit sooo badly! :) I used to spend day after day with my grandma, learning all sorts of domestic skills, and I still love 'em all. I wish I could show her the things I've made. That hat is great. I had actually just been trying to decide on a yarn to make one myself a day or two ago. I think that is quite possibly the BEST hat I've seen in a long, long time. So super cute. Not cheesy at all. I feel the same way about my grandma...I just haven't finished a quilt yet. :) But it's on my list of things to do. Your quilt is gorgeous, btw! I love the color combo. What a lovely post, both my grandmas were always making and creating. Love the quilt and hat! I don't know...that hat makes ME a little weepy! LOL Seriously, I adore the hat. Really, really adore it. 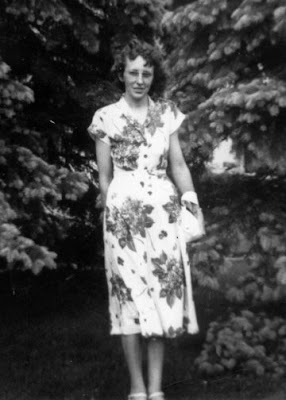 And the words (and pics) about your grandmother are wonderful. Mine is sick with cancer and a brain tumor right now so I've been doing little things to give a nod to her in my life lately. I'll have to post some old pics too. That is such a beautiful gesture. awww, this is so heartfelt! Ok. wow. first off...killer old photo..gotta do something cool with that pic. And yes! It might be weepy..but, we gotta go "there" sometimes...and usually out of it..comes the best inspiration. Case in point: girly quilt. Oh my stars! hehe Seriously, that is so awesome, Jenn..
And I love that hat.. I know that you can "do" hats..so it makes it hard to see if it could really work. but, i think that hat really does work..like on anybody. It is a really different blue. and it's cool, b/c you brought it down with the brown button. JUst love it. Such a wonderful post to read. And your grandma would be so proud of that quilt...it's gorgeous. It's really strange...before I read this post today, I literally just decided that I wanted to try some quilting! Have no idea where to start though! Might get some books out of the library. that hat rocks. and yea for carrin on your gramm's skills. how's this for weird, my verification "word" is prusloc. they don't really mean word, do they? I know I'm late on this, but totally cute quilt and totally sweet post.